This meal is absolute perfection: hearty and filling without being too heavy! 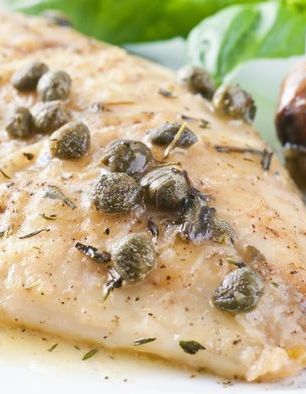 Halibut is a really nice choice for a meal because it blends so well with other flavors. Our recipe keeps things simple with a light garlic-lemon sauce that creates a lovely flavor that ties everything together and elevates the dish. This halibut dish is straightforward and packs a serious punch with its zestiness– add this to your weekly dinner line-up and enjoy! Season both sides of fillets with salt, pepper and Old Bay, and melt olive oil and butter in a large pan over medium heat. Allow the oil and butter to get really hot, then carefully place 2 fillets in pan. Cook for 4 minutes, then flip and continue cooking for another 2-3, or until completely cooked through. Remove from heat, cover and continue with remaining fillets. Once you’ve finished cooking the fish, add the garlic and cook until slightly softened and fragrant. 2-3 minutes. Add lemon juice and wine and bring to a boil. Reduce heat and let simmer 5 minutes, until thickened. Stir in the capers and lemon zest, taste and adjust seasoning, if necessary. Return fish to pan and coat with sauce. Transfer to serving plates and spoon sauce over the top. Serve hot and garnish with lemon wedge.